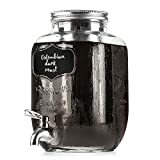 If you love cold brew coffee and wish you had a huge supply always ready to go, then check out this cool new Primula Cold Brew Coffee Maker / Dispenser. This unique coffee maker / dispenser makes and serves up to 2.5 gallons of cold brew coffee that is sweeter and 65% less acidic than conventional hot brew coffee. Just add fresh ground coffee to the three stainless steel mesh cores, fill the dispenser up with water, and put it in the fridge for 24 hours. It features a built-in flavor mixer to stir up the natural oils and flavor that settle, a cast aluminum cover, and a front spigot. Perfect for making cold brew coffee and even iced tea if that's your chilled beverage of choice. Size: 15.25" L x 6.5" W x 10.34" H - 4.72 lbs.